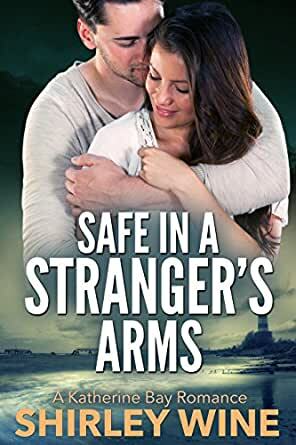 Safe In A Stranger's Arms (A Katherine Bay Romance Book 2) - Kindle edition by Shirley Wine. Literature & Fiction Kindle eBooks @ Amazon.com. “Promise me, Jenna; promise you won’t sell the land.” Haunted by her mother’s dying words, Jenna Mullein tries to discover the truth and quickly learns that too many people in Katherine Bay have vested interests in muddying the truth. When her persistent questions leave her fearing for her life, Gabe Callahan steps in to help. Property developer, Gabe Callahan is scoping out land for an upmarket resort and intends to be in and out of Katherine Bay before locals are alerted, an intention that is thwarted when he’s drawn into the troubles of a single mother—and finds it impossible to walk away. In the face of danger, festering secrets and small town prejudice, fate dangles a cherished dream of home and family in front of him, but he worries—will Jenna still love and respect him when she learns the dark secrets he’s hiding. If you like your romance spiced with mystery, danger and intrigue, you’ll find it here in Katherine Bay. Welcome to the small idyllic town, where nothing is quite what it seems, where dangerous secrets lie hidden and it can be dangerous to your health to take anyone at face value. Download your copy of Safe In A Stranger’s Arms today and uncover the secrets and lies, the hidden passions that simmer beneath the surface of this Coromandel town, New Zealand’s playground for the rich and famous. What starts as a rollickinggood romance quickly grows into an engrossing mystery/suspense! nD'tale Magazine. A New Zealand story. It has romance, intrigue and is so well written. I truly could not put it down. I also loved that it is a full novel — Lovetoread. Book 3: A Perfect Lie — Jace and Ashlyn. This Manuscript was Highly Commended--Clendon Award--run in conjunction with Romance Writer&apos;s of New Zealand. "I read this entry in one sitting--I couldn&apos;t put it down." --Judge&apos;s comment. This germ of the idea for this book grew out of a real life drama. A long time ago, I read a newspaper article about a family cheated out of their inheritance by a dishonest trustee, and the incredible legal battle they faced trying to reclaim what was rightfully theirs. 3.0 out of 5 starsCan a billionaire in disguise save a single mom with twins from someone trying to evict her? Gabe Callahan is in Catherine Bay to talk about a secret real estate acquisition. It was by chance he came upon Jenna Mullein's door... and greeted by a loaded shotgun. What had spooked the single mother of twins so much that she had to resort to the threat of violence to protect her homestead? // Jenna had lived in her house all her life... It was her grandfather's land and house. Her mother, with her final words, made her promise "Jenna, promise you won't sell the land..." So why is a neighbor forcing her to leave? Why are there thugs threatening her? // Gabe was supposed to get the deal done before speculators hit the area, but his encounter with Jenna left him rattled... and fiercely protective of her and her family. But the town is full of secrets... Does Jenna really own the land? If so, where is the deed? Is the local cop dirty? Who murdered the town librarian? Can anyone be trusted... even Gabe? Okay, this almost feel a bit like a Jack Reacher mystery, except Gabe had to call in help from his billionaire brother and his connections, so it doesn't feel that much... tense. A lot of explanations was told, not shown. Not quite up to the author's usual romantic suspense standards. If there were 10 stars I would give them to this book. At first it seems just like a lovely romance and then turns into a suspense thriller that has you on the edge of your seat not knowing who is behind it all. The characters are really nice people and the two little kiddies: Zoe and Zack sound absolutely gorgeous to the extent when they cuddle into their mothers neck you can practically feel and smell them. They sound so cute. I was really nervous about two thirds of the way through thinking it was not going to be a happy ending, but all turns out for the best in the end. I would have liked there to be an after statement, say six months or maybe a year down the line so we could know what happens to all their plans. I think it is because I didn't really want the book to finish. When I downloaded this book (for free) I began reading and just couldn't put it down. Luckily reading it on a Tab I was able to sit in bed and read it in the dark until I was nearly falling asleep. If you are a romantic that loves a few twists and turns, including a few murders along the way then you will love this book as much I did. Can't wait to read more from Shirley Wine, she is definitely on my author list. Don't hesitate downloading this book, you will not be disappointed even though there are a few typo errors and a few words thrown in where they shouldn't be (I think this happens when transferring the book to an ebook). It didn't put me off. Thank you Shirley, keep on writing. Great read. Author did great job of creating characters that you can picture and have empathy for. Strong story line. The strength of family and friends that always have your back. Jenna was almos broken but was brought back by Gabe, who she in turn help get past a great injustice. Could not put it down. Looking forward to next story. Wow. This author lacked a lot into this novel. Beaten and almost broken characters because of the greed of others became hopeful. The good guys always win in the end. It just took a lot of bravery and friends to get there. I usually don't read romance mysteries but I couldn't put this book down. I really enjoyed reading about the different characters and loved it. This is a must read for anyone who enjoys a great mystery with a love affair. This story had my full attention from the minute I started reading. It has an awesome storyline, relatable characters, and a fair amount of suspense. Combine that with the romance and you have a winner! Thoroughly enjoyable. 5.0 out of 5 starsTotal package! Romance and adventure all in one book. Jenna and Gabes story is a must read. To learn to trust and love again after being deceived and almost broken, these two learn valuable lessons. And, discover they have more in common than they thought.